Many practitioners don't realize, or forget, that weapons came first in the martial arts. Jiu-jitsu, one of the forerunners of the empty-handed systems, was actually developed much later than the classical choice of weapon of feudal Japan: the sword. The sword (ken) was considered the soul of the classical warrior in both the East and West. Almost any cut delivered during a medieval swordfight was lethal and final. It should go without saying that both the kenshi and chivalrous knight took their training quite seriously. Weapons are taught alongside most modern martial art systems. On Okinawa, customary weapons were banned on and off for centuries by various invading kingdoms. Ingenuity became the way of strategy and deception and kobudo was born. Since farming was a way of life there, its implements could be used as authentic weapons if the need arose. Kobudo, while considered as an integral part of traditional karate, is really a system unto itself. In Japan, kendo (the way of the sword) is actually regarded as the quintessential budo form, in part, because of its roots to kenjutsu (swordfighting). In iaido, practice involves removing a live blade from the scabbard as quickly and efficiently as possible. This idea brings to mind the gunslinger drawing his revolver from the holster during the wild shootout days of the Old West. Weaponry is yet another aspect of the martial arts that remind us that traditional training's original focus was about life and death. In the aikido style I used to train in, bokken, jo, and tanto were taught from the very beginning. Great post! I love to see you talk about Okinawan kobudo. My instructor was telling us this week that there are few martial arts forms that focus on weapons the way that we do. I can't imagine not using them. Bo, sai, tunfa, and nunchaku are staples of our style. What else do you know about Okinawan, I hear peopel talk about Okinawan a lot. Since weapons are turning into my forte' in martial arts, I can totally appreciate your post here. I think one thing that is interesting, and I don't know if it applies to other martial arts methods in the USA, but I know the ATA really promotes the idea of using ProTech weapons-- essentially weapons with foam or other safety features rather than the real thing. I'm thinking that this is not only good for safety, but in the end, it hopefully shows the progress of society that while it's good to learn the skills involved in handling a weapon of choice, that doesn't mean that we actually have to USE the weapon. Know what I mean? Hopefully we are a more peaceful, sophisticated world for learning how to use weapons covered in foam instead of blades or hard materials. It's interesting how a defensive art like aikido also includes weapons. In some aikido schools, iaido is offered. 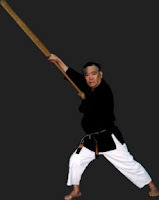 I'm aware of all the kobudo katas you have in Okinawa Kenpo; a formidable list! Let me know when you start training with the nunchaku. C'mon, Eddie -- I finally post something about iaido and the Japanese kenshi, and you're asking me about Okinawa? Weren't you just there about a month ago? You need another vacation! Safety is definitely an issue. It seems everyone who has been doing kobudo (weapons) a while has a nasty story to tell about an injury occuring during practice. Some of those weapons (such as the kama - sickle) are incredibly sharp. I don't know if the foam thing would be accepted in other styles, although in kendo (in Korean it's kumdo) they use a bamboo shinai as a weapon (as opposed to a steel sword). Then again, we don't spar with kobudo weapons. So while foam might be user friendly, it may not be regarded as traditional. I'm not in favor of foam weapons. The mental focus required when handling a 'live' edge is lost, and it can't be duplicated. True. You could make a similar argument for sparring gear, which I'm definitely in favor of. But regarding the foam weapons, I would make certain exceptions. I wouldn't dream of letting a child handle a 'live edge'. For the serious practicionner, they have no sense. If you've been training for 3 years straight with a weapon, what good does it do to have foam weapons? Nothing! When a beginner takes nunchakus --> OUCH! Foam padding is good to learn the moves. Then, when you're confident, try real ones. From sitting baby to crawling baby, to walking baby. Progression of things. Burning steps is never good. Except if you enjoy being hurt. That's a whole other story. "Weaponry is yet another aspect of the martial arts that remind us that traditional training's original focus was about life and death." Ha! Indeed. It's easy to lose focus, sometimes. I apparently missed out by commenting so early. My daughter is 5 years old. She uses sai, a bo, and tunfa as they were intended. Hers are just smaller. We both use foam nunchaku. We don't need to know how to use them until brown belt, and I won't be switching to wooden ones until I'm ready. Part of working with these weapons, I think, is having respect for them: what they can do to others, what they can do to you, and therefore, you are driven to learn how to use them correctly. I don't see the harm in using the real thing. We also use real weapons (not foam) for bunkai. Of course, we are going through the motions of kata when doing so, but soft weapons wouldn't have the same feel. Okinawan kempo and kobudo is apparently known for their usage of weapons. The foam nunchaku are pretty obviously foam, unless you get the black set and then you look kind of cool (as cool as you can look with foam nunchaku). There do make foam tunfa, but I got my daughter the kid sized real thing. We do use kama, once at black belt level. When I go to the dojo this week, I'll check them out and report back. Foam tunfa? OK. And they make foam nunchaku that looks cool but is still obviously foam. Interesting! We don't do kama in Isshinryu, and that's fine with me. I have a hard enough time with bo, sai and tunfa. Thank you for getting back to me on all of this. Tatsuo Soke believed in the one strike philosophy and encouraged the use of makiwara to that end. At the very least a good solid canvas heavy bag for today's Karate-ka. Not to mention the kendo gear he used to promote that philosophy in kumite.